Well, to be more accurate, it has been the summer where our poor vegie patch has been scorched and drowned, often in the same week. Back in late spring I was happily raising seedlings and anticipating a summer where our kitchen would be overflowing with produce. Sadly, like many fellow gardeners I've spoken to lately, much of our patch simply didn't survive the scorching hot days, followed by torrential rain, with mould, mildew, and disease inducing humidity in between. Remember the great potato patch we made back in September? From strong beginnings the plants then seemed to suddenly wilt and die. 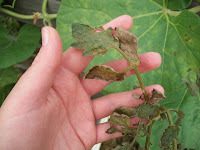 I suspect either potato blight or black leg. After a while we decided to excavate and see what had happened. Many of the spuds had started well, but the heavy rain had compacted the sugar cane mulch and compost into a thick, wet, rotti ng layer and anything above that layer died. Our yield was a handful of small deformed potatoes. However, on the upside, the potatoes that were voluntarily growing in the compost heap seemed to be unaffected and yielded a good number of decent sized spuds. And while some of the ones from the main patch weren't edible, they were possibly the rudest looking potatoes ever grown, so we got some giggles. Back in October I had started planting tomato seeds and by early November I had so many seedlings I was giving the excess away to family, friends and anyone who happened to drive past. Later in November saw us going on holidays for a week, during which we had several absolute scorchers and I came home to some rather scalded and sorry looking tomato seedlings. Still, we planted them out and thought they might just come good, only to have them drowned in rains, scorched again and getting every tomato affliction under the sun. A number have rust, much of the fruit has blossom end rot from the erratic rain, a lot of fruit has simply split or rotted while still green, and to top it off we've got fruit fly. I've tried spraying a Bordeaux mix to see if that helps with the rust. We've had a few good, if small, tomatoes from what I think is a Red Tommy Toe. Sadly, I think what I need to do is pull them all out to try and stop disease spreading further. 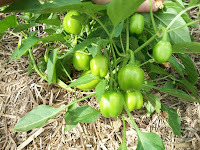 We had 4-5 mini capsicum plants and 2 regular size plants. They've been strong and early on had lots of flowers and fruit developing, but the insane weather has meant that most of the fruit are rotting before they're ripe. We have managed to get a couple of very cute mini capsicums, but don't hold much hope for the rest in this humid weather. I really thought the corn was going to be alright. Sadly, the humid weather isn't great for corn either. 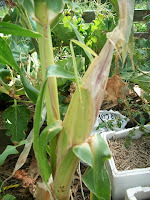 A lot of the cobs had aphids and some kind of borer. The ones that looked okay were very disappointing to eat. They tasted like glue - bland and starchy. I don't know whether we didn't have enough of them to get good pollination or there was some nutrient deficiency, or both. There is one lone apple cucumber that has survived against the odds. Two plants were lost when the dogs got into the patch and had a bit of a rampage. The other one succumbed to the rampant powder mildew that threatened to cover every curcubit in sight. Diligent spraying with diluted milk seems to have saved my lone survivor and we even got a decent sized and quite edible cucumber from it. 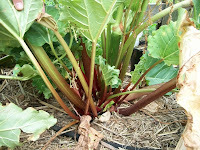 The rhubarb grew to epic proportions with massive leaves and thick stalks. However, in the last few weeks, I think the rain and humid ity has taken its toll as many of the stalks became rotten and I think the crowns may actually have rot from being too wet for too long. This is the first time I've grown rhubarb so I don't know if they're meant to die back at the end of summer or whether this is actually crown rot. There are still some new green stalks emerging from one so I'm hoping it will hang in there. However, it hasn't all been bad and in many ways we've learnt a lot from those plants that didn't make it.